The Long Island Feline Adoption Center is a 501(c)(3) non-profit charity founded exclusively to find adoptive homes for homeless cats and kittens. We provide an interim loving home and environment conducive to socializing cats and kittens – preparing them to both give and receive love in a new home. Staffed by loving volunteers, our organization strives to dissolve the fear and mistrust of our guests, through caring, understanding, love and attention. Some of our guests roam cage-free in a simulated home environment 24 hours per day, seven days per week. Others, “not quite ready for 24/7” sleep in their “home” cages at night, but during the day they are free to roam and romp, play and socialize – eliminating the onset of depression from initial captivity and/or prolonged life in a cage – and making them truly and obviously happy. 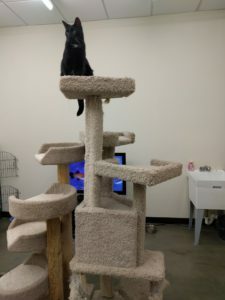 They even have their own TV and DVD changer system, with multiple screens playing videos made for cats – to entertain and guarantee that boredom never need set in – and as they normalize they make the transition to the cage-free area. Trust and love are nurtured and developed in the felines so that they can then graduate to a truly “at-home” environment and socialize fully with others awaiting adoption. To aid in assimilation on adoption, our domesticated (some originally fully feral) guests enjoy a simulated “at home” environment – socializing with other cats and free to roam “the house” 24 hours per day. We genuinely are thankful that our approach enriches lives and provides a gateway to a new and even better life in a new and loving home. Accept homeless felines from Long Island (New York) and facilitate their adoption to appropriate homes. Place homeless felines into foster care when adoptive homes are unavailable. Work with a network of feline organizations which TNR, accepting from them the felines suitable for adoption after socialization. Accept lost domesticated felines after all efforts to find their owners have been exhausted. Provide shelter, food and medical care (through veterinary services) while finding suitable homes for the felines. Provide a facility for adoption where the felines and potential adopters can interact. Provide a nurturing and unique multi-stage environment that facilitates the socialization of homeless and abandoned felines. Provide a simulated at-home environment for our cats and kittens awaiting adoption. As noted before, in short, we help frightened homeless cats and kittens learn to love and trust people – and then place them in loving homes.